Outfit #1 is a fall/ winter staple for me. I love wearing stonewash blue jeans and these are my go to year round. They are so standard that you may forget how easy it is to own a pair of these. I wear them with EVERYTHING, but my favorite way to wear them is with a boxy high neck longsleeve top. 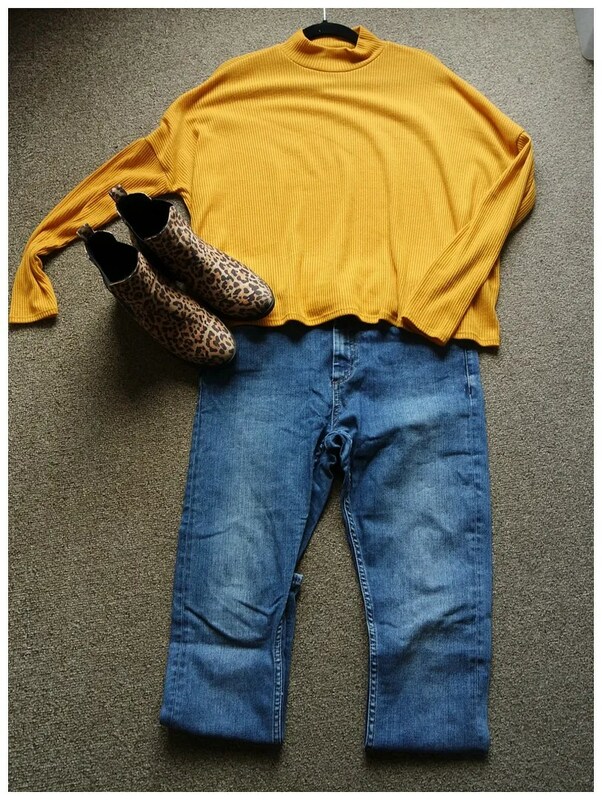 The mustard yellow is a nice clash against the blue and in keeping with the yellow theme, I decided to pair this with some leopard print boots. Winning combo! 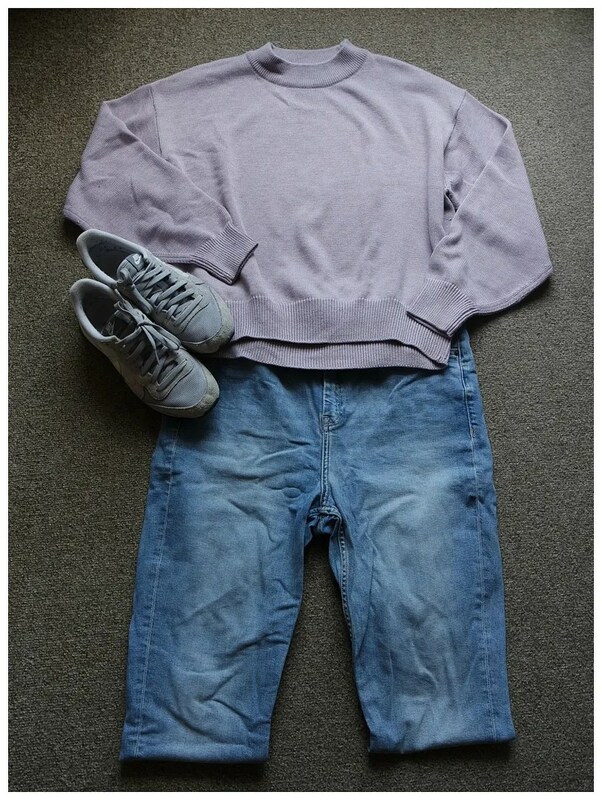 This outfit is an example of a pair of highwaisted jeans that are not Jamie Jeans. They are still Topshop though: they are the Binx jeans. I think they only did these for a season, but I really love mine. They are very much like Mom jeans, but then with a bit more of a tapered leg rather than a straight leg. Therefore they are much more flattering. The light wash pairs really well with pastels, which is why I decided to throw this lavender H&M sweater on top. To round off this super relaxed outfit, I decided to pair this with my comfiest pair of sneakers which are the Nike Internationalists. Black skinnes are the staple of all staples if you’re thinking of jeans if you were to ask me and I love wearing them in the fall/ winter time. That and a grey. 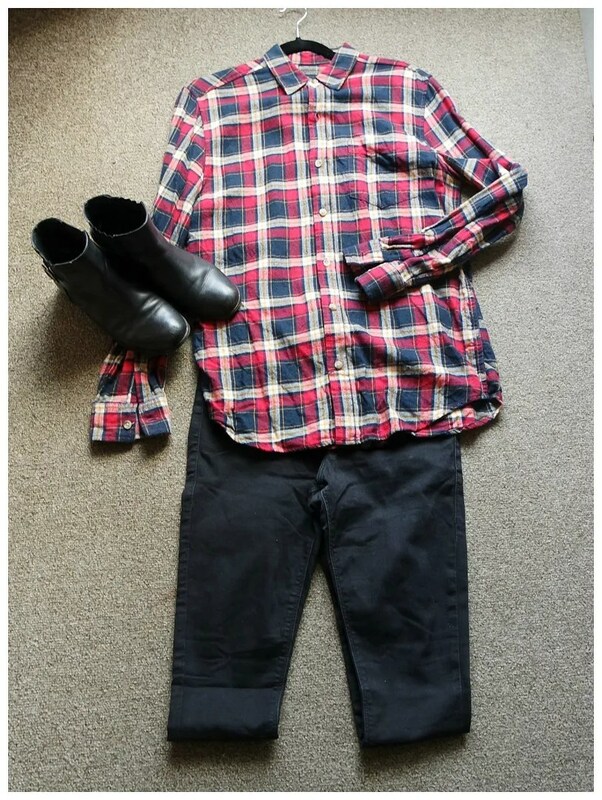 I love wearing it with flannel shirts (this one is Primark) and like keeping things simple with a pair of black Chelsea boots. These boots are by New Look and I like how the bottom is quite dark, but that does make the pattern of the blouse pop all the more. Since jeans are such a basic item, I think they work really well paired with a fun print. From leopard to polka dots to tartan: if you want to try wearing a print but don’t know how, just throw it on with a pair of jeans and you’re good to go. 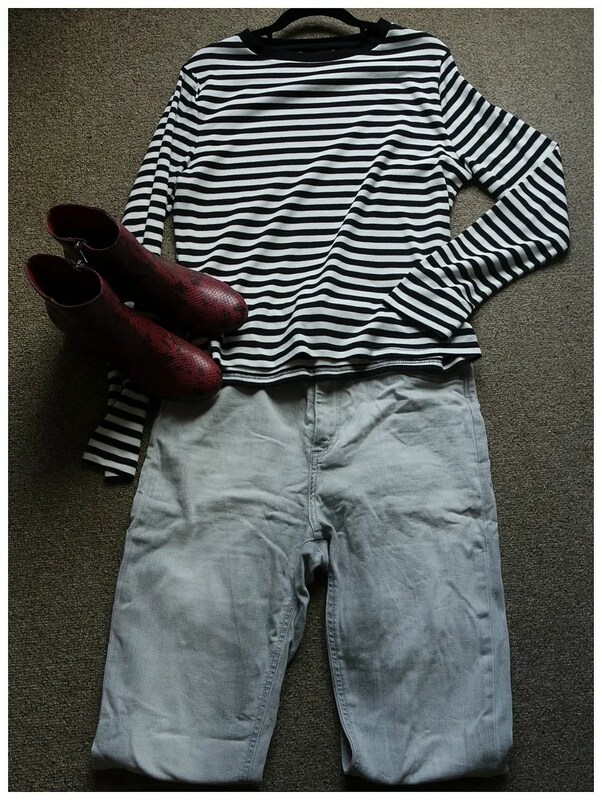 Here I paired a striped top by Topshop with a pair of highwaisted Farleigh jeans by ASOS. These jeans are a spring staple for me, they are a super pale grey, almost white, but not quite and that is why these are great for the warmer weather. To make the outfit more fall appropriate, a pair of dark boots can work really well. I opted for a pair of red snake skin print boots by Urban Outfitters. I like how they add a pop of color to the outfit and this also shows you that mixing prints can be done easily if your prints aren’t too close together. The final outfit is all about a pair of highwaisted jeans that are not really jeans, but more of a pair of leggings. These Cheap Monday jeans are so thin and skintight that they might as well just be called a jegging. They are bit thicker though, but still very comfortable. I love wearing these in the fall time with some of my favorite burgundy items. These jeans pair so well with my cherry red 1460 Dr. Marten’s. 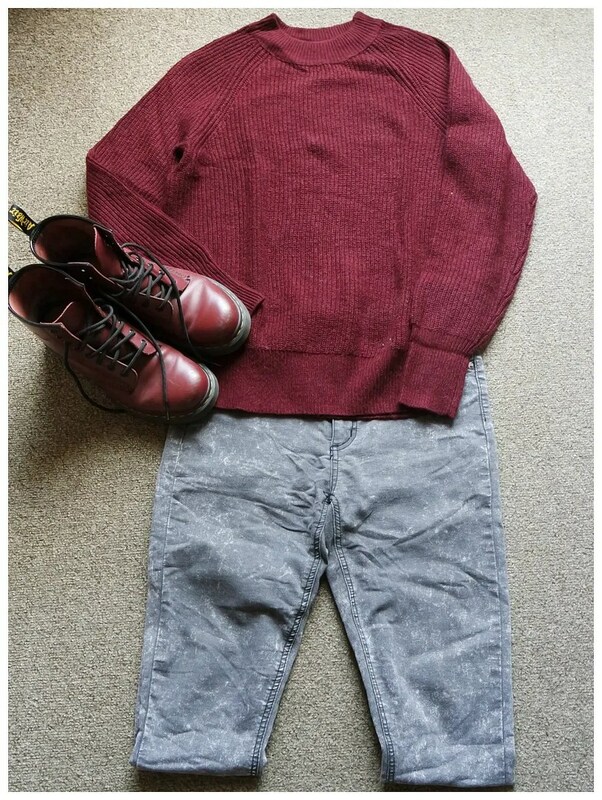 In line with the burgundy theme I love throwing on a burgundy H&M sweater and there you have a perfect fall outfit! How do you like to wear highwaisted jeans? I user to wear Tpthem from nydj. Nice ways to style high waisted jeans!